“Ruins of Richmond, VA, 1865,” by photographer Mathew Brady (1822–1896). National Archives and Records Administration, College Park. Wikimedia Commons. By the spring of 1865 Robert E. Lee’s army of about 60,000 men held a line in Virginia that extended from outside the Confederate capital, Richmond, forty miles south to Petersburg. In an attempt to open an escape route to the west for his army, Lee attacked Fort Stedman, a Union strongpoint east of Petersburg, on March 25. The attack failed, and about 3,000 Confederates were killed, wounded, or captured. 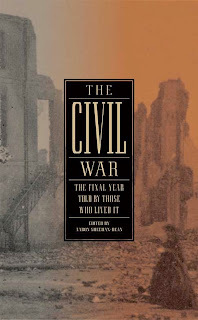 The defeat marked the beginning of the end of the Civil War. After heavy fighting on March 31, Union forces advanced on Five Forks, a crossroads about twelve miles southwest of Petersburg defended by a force of 10,000 under Major General George E. Pickett, who had been ordered by Lee to hold the position “at all hazards.” On the afternoon of April 1 the Union Army broke the Confederate lines at Five Forks. General Ulysses S. Grant then ordered an assault on the Petersburg defenses at dawn on Sunday, April 2. Within hours Lee telegraphed the Confederate War Department that both Petersburg and Richmond would have to be abandoned that night. It is with Jefferson Davis’s receipt of that message that Sallie Brock begins the following account, which describes the fall of Richmond—and the devastation caused entirely by the actions of the fleeing Confederate military. 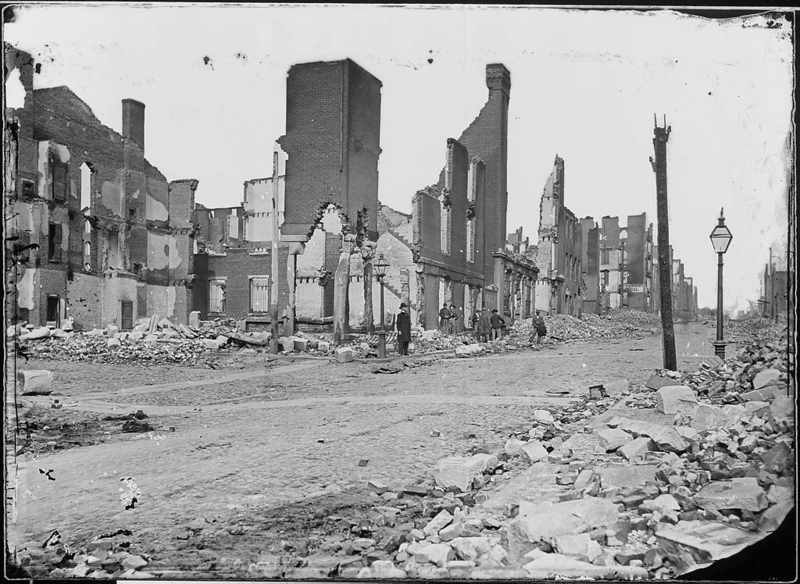 After a triumphant entry, Union soldiers struggled to put out the fires, but it is clear from accounts that the conflagration was far too widespread—and the damage was already far too extensive—for any effort to save much of the city. On Tuesday, April 4, President Lincoln ignored the concerns for his safety and entered Richmond with his son Tad to meet with Union leaders, speak with the residents, and survey the damage. The miseries of our situation which would have been incalculable at best were inconceivably enhanced by the disastrous burning of the business portion of the city. Nearly all the supplies of food were kept in the stores which were consumed by the fire and our poor people were almost totally dependent upon the mercy of the captors. For several months no remunerative employment could be obtained by the masses and they were compelled to live by charity. Born in Madison County, Virginia, Brock had moved with her family to Richmond in 1858. In early 1861 she was working as a tutor about fifty miles away, in King and Queen County, but returned to Richmond when the war began and remained there for its duration. After the fall of Richmond she moved to New York City and two years later anonymously published her account of the war, which has remained in print for most of the past century and a half. In 1873 she published a poorly received (and soon forgotten) novel, Kenneth, My King, described by one recent scholar as “four hundred pages of courtship.” In 1882 Brock briefly returned to Virginia to marry Richard Putnam, an Episcopal minister from Boston. The couple lived in Brooklyn for the rest of their lives, but both were buried in Richmond. The morning of the 2d of April, 1865, dawned brightly over the capital of the Southern Confederacy. A soft haze rested over the city, but above that, the sun shone with the warm pleasant radiance of early spring. . . . If you don't see the full selection below, click here (PDF) or click here (Google Docs) to read it—free!